In a nuclear power plant, heat energy is generated by a nuclear reaction called as nuclear fission. Nuclear fission of heavy elements such as Uranium or Thorium is carried out in a special apparatus called as a nuclear reactor. A large amount of heat energy is generated due to nuclear fission. Rest parts of a nuclear power plant are very similar to conventional thermal power plants. It is found that fission of only 1 Kg of Uranium produces as much heat energy as that can be produced by 4,500 tons of high grade coal. This considerably reduces the transportation cost of fuel, which is a major advantage of nuclear power plants. Also, there are large deposits of nuclear fuels available all over the world and, hence, nuclear power plants can ensure continued supply of electrical energy for thousands of years. About 10% of the total electricity of the world is generated in nuclear power plants. Heavy elements such as Uranium (U235) or Thorium (Th232) are subjected to nuclear fission reaction in a nuclear reactor. Due to fission, a large amount of heat energy is produced which is transferred to the reactor coolant. The coolant may be water, gas or a liquid metal. The heated coolant is made to flow through a heat exchanger where water is converted into high-temperature steam. The generated steam is then allowed to drive a steam turbine. The steam, after doing its work, is converted back into the water and recycled to the heat exchanger. The steam turbine is coupled to an alternator which generates electricity. The generated electrical voltage is then stepped up using a transformer for the purpose of long distance transmission. The image below shows basic components and layout of a nuclear power station. A nuclear reactor is a special apparatus used to perform nuclear fission. Since the nuclear fission is radioactive, the reactor is covered by a protective shield. Splitting up of nuclei of heavy atoms is called as nuclear fission, during which huge amount of energy is released. Nuclear fission is done by bombarding slow moving neutrons on the nuclei of heavy element. As the nuclei break up, it releases energy as well as more neutrons which further cause fission of neighboring atoms. Hence, it is a chain reaction and it must be controlled, otherwise it may result in explosion. A nuclear reactor consists of fuel rods, control rods and moderator. A fuel rod contains small round fuel pallets (uranium pallets). Control rods are of cadmium which absorb neutrons. They are inserted into reactor and can be moved in or out to control the reaction. The moderator can be graphite rods or the coolant itself. Moderator slows down the neutrons before they bombard on the fuel rods. This type of reactor uses regular water as coolant. The coolant (water) is kept at very high pressure so that it does not boil. The heated water is transferred through heat exchanger where water from secondary coolant loop is converted into steam. Thus the secondary loop is completely free from radioactive stuff. In a PWR, the coolant water itself acts as a moderator. Due to these advantages, pressurised water reactors are most commonly used. In this type of reactor only one coolant loop is present. The water is allowed to boil in the reactor. The steam is generated as it heads out of the reactor and then flows through the steam turbine. One major disadvantage of a BWR is that, the coolant water comes in direct contact with fuel rods as well as the turbine. So, there is a possibility that radioactive material could be placed on the turbine. In the heat exchanger, the primary coolant transfers heat to the secondary coolant (water). Thus water from the secondary loop is converted into steam. The primary system and secondary system are closed loop, and they are never allowed to mix up with each other. Thus, heat exchanger helps in keeping secondary system free from radioactive stuff. Heat exchanger is absent in boiling water reactors. 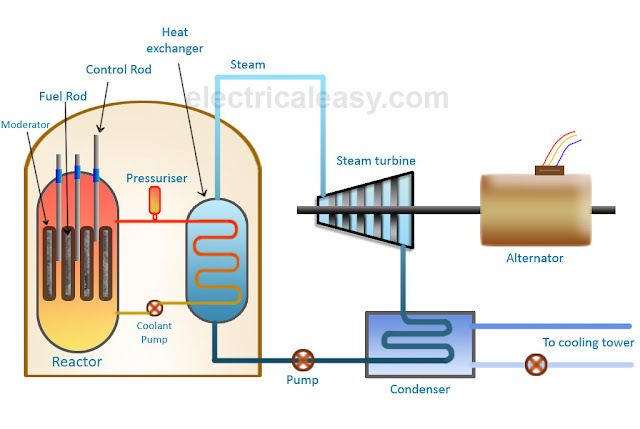 Generated steam is passed through a steam turbine, which runs due to pressure of the steam. As the steam is passed through the turbine blades, the pressure of steam gradually decreases and it expands in volume. The steam turbine is coupled to an alternator through a rotating shaft. The steam turbine rotates the shaft of an alternator thus generating electrical energy. Electrical output of the alternator is the delivered to a step up transformer to transfer it over distances. The steam coming out of the turbine, after it has done its work, is then converted back into water in a condenser. The steam is cooled by passing it through a third cold water loop.